The end of the year for FTH:K means a time of showing you all what we have been up to throughout the year. Well, all the stuff that we’re allowed to show you, of course! An exciting project that we have been working on is a performance called Ek Roep Vir Jou Vanaand which some of you might remember from the showcase we did last year. The piece came out of our Autocourse programme and this year, FTH:K‘s leading Deaf performer, Lysander Barends, was thrilled to receive his first individual funding grant from the National Arts Council for this autobiographical performance. 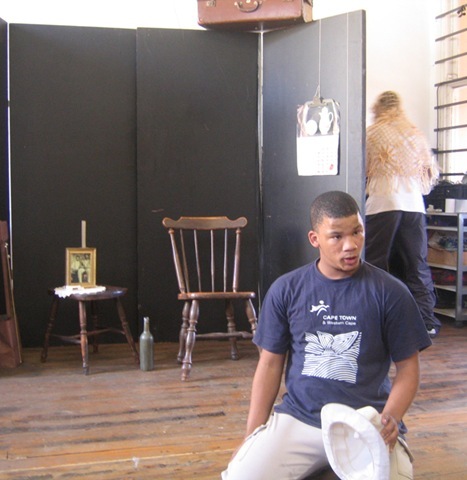 Since then, the Ek Roep team have been hard at work turning the short performance into a full-length work, touring it to schools in and around Cape Town, and preparing it for its short run at the Intimate Theatre from 27th – 31st October. facets of a father and son trying to make ends meet in antagonizing times. Their humour and relentlessness, coupled with shadow puppetry, soundscapes and non-verbal performance, make these characters and their story a visual gem. Contact us if you would like to know more or if you would like to book your tickets.